Ghillies are specially designed shoes used for several types of dance. They are soft shoes almost always made of supple leather that forms to the foot, similar to ballet shoes. They are used by women in Irish dance, by men in Scottish country dance, and by men and women in Highland dance. They use laces which crisscross the top of the foot and are tied together similar to a sneaker. Super cute ghillies pendant. Handcrafted in our Studio in sterling silver, it measures 15/16" by 1/4" (24mm x 7mm) and includes an 18" sterling silver high quality chain. 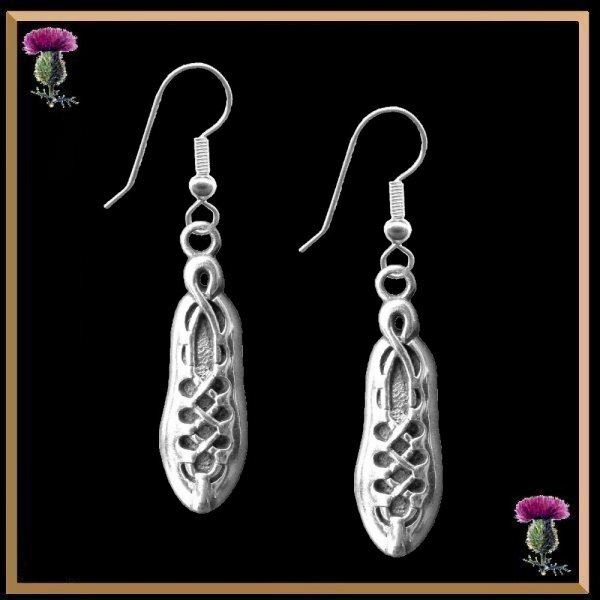 Complete your set with our matching earrings, a must have for all Highland dancers. What a great way to show your love for traditional highland dancing with these cute and fun pair of earrings. Handcrafted in our Studio in sterling silver, they measures 15/16" by 1/4" (24mm x 7mm) and 1-3/4" from the top of the hook. Complete your set with our matching pendant, a must have for all Highland dancers. What a fun way to show your love for traditional highland dancing with this cute and adorable double ghillies pendant. Handcrafted in our Studio in sterling silver, this lovely pendant measures 1-1/4" (32mm) by 1/2" (13mm). This darling charm is a playful accessory to any wardrobe. Celebrate your love for Scottish Highland Dancing with our adorable dancer pendant. 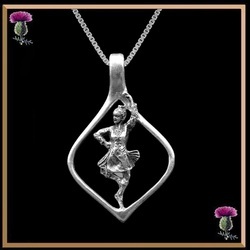 This is a beautifully detailed pendant depicts a Highland Dancer in full dance costume. Solidly made in sterling silver the pendant measures 1-5/16" by 1/2" (34mm x 13mm) and includes a 18" high quality box link chain. 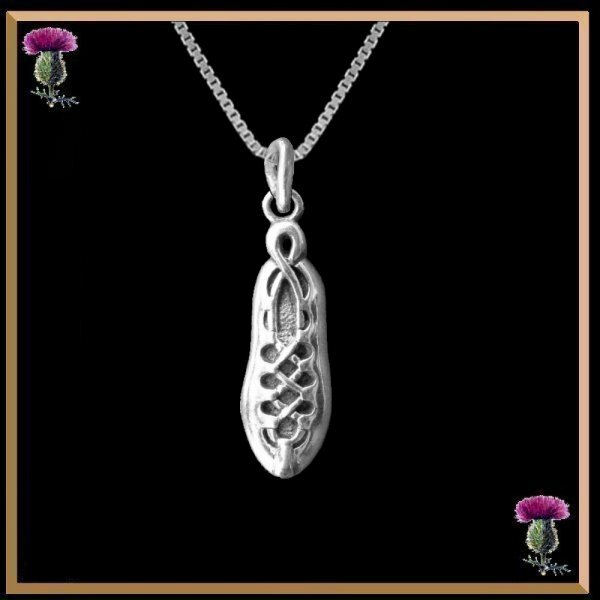 Our sterling silver pendant would make the perfect gift for any Highland Dancer. The brooch is sterling silver and measures 1-5/16" by 1/2" (34mm x 13mm) with a high quality pin back. This is a beautifully detailed pin depicts a Highland Dancer in full dance costume. 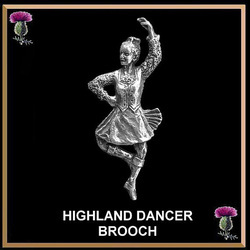 Our sterling silver brooch would make the perfect gift for any Highland Dancer. This lovely sterling silver oval Highland Dancer pendant is solidly made and celebrates Scottish Highland dance. This large and solid pendant measures 1-7/8 " high by 1-3/16" wide (48mm x 30mm). This pendant is a substantial size and makes quite a show stopper. A wonderful gift for any Highland Dancer! Includes an 18" sterling silver box link chain. We also make this design in 10K and 14K gold. Please inquire. What a fun way to show your love for traditional Country dancing with this elegant brooch. Handcrafted in our Studio from sterling silver, this lovely pin measures 1-1/16" (27mm) by 15/16" (25mm). This lovely pin can also be worn as a tie tack or on the lapel of a jacket.